A healthy amount of free cash flow among the world's public E&P companies could signal the return to super profits, according to Rystad Energy. 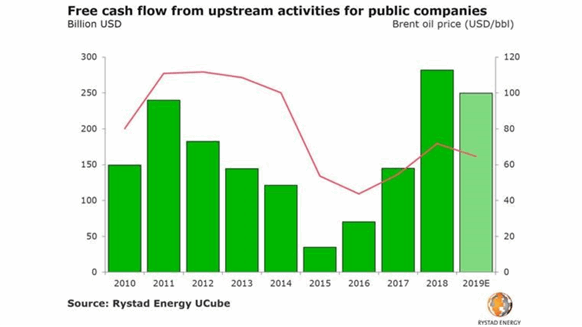 The world’s public E&P companies saw their free cash flow (FCF) surge to nearly $300 billion last year and 2019 may be just as promising, according to analysis by Rystad Energy. “The fact that E&P companies are able to deliver the same shareholder returns despite much lower oil prices points to an impressive increase in profitability,” Rystad’s head of upstream research Espen Erlingsen said. Rystad looked at estimated global FCF for all public E&P companies since 2010. Their analysis shows that FCF peaked in 2011 but declined between 2012 and 2014 due to increased budget investments and more commitments. The FCF was reduced considerably in 2015 as the oil price collapsed. However, since 2015, FCF has had a gradual recovery to the all-time highs of today. According to Rystad – who analyzed recent cash flow statements from all the majors plus Norway’s Equinor – there’s a clear winner. “…almost 70 cents for every dollar in profits generated last year for these companies ended up in shareholders’ pockets,” Erlingsen said.